I remember when my Dad used to hark on about shoe trees. But I’m pretty sure this isn’t what he meant! I’m talking about trees, real trees, trees that grow out of the ground. Trees that are covered in shoes. Yes, shoes. 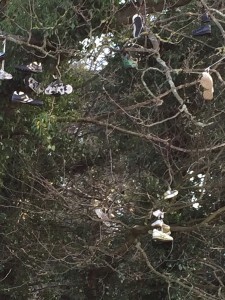 Shoes with their laces tied together and then thrown over a branch of the tree. What’s that about? At first I thought there was a lone pair of shoes, and I let out an internal ‘awwww’, when I thought about the poor bullied child who’d be going home to his mummy, minus his shoes and feeling crap about himself. But then my friend pointed out all the other shoes! There are far too many to be the work of one bully. I’ve obviously ‘Googled’ it: what else would you do under the circumstances? And it turns out that this is not a new phenomenon. A few years ago, there were at least seventy-six (don’t you just love relying on Wikipedia as a source) such trees reported in the United States. It appears that it may be an offshoot of a practice whereby people would throw their shoes over a power line. But nobody seems to know why that happens either. There are theories of course. Some are nice and some are a bit grim. One theory is that each pair of shoes marks a gang murder! In Edinburgh?! I don’t think so! There was a gang murder up here last year: some chaps chased another chap up here from somewhere in England, and the fuss that it caused?! I don’t think that gang murders are particularly rife in Auld Reekie. Another theory suggests that it marks a place where you can get drugs. Again, while I’m not suggesting that Edinburgh is drug-free, I don’t think this would be a popular spot for drug dealing. There’s no shelter, for one, and it’s like a Piccadilly Circus for dogs most of the day. And it’s unlit after dark, so not ideal, I’d have thought. Although the picture of drug dealers with head torches, cagoules and picnic blankets, fending off a load of friendly dogs, is making me smile. Some of the nicer explanations are that it started with soldiers marking the end of their basic training, or even their service in the army. They’d paint their boots yellow or orange, and throw them over a power line close to their barracks. Others suggest that it’s young lovers, or parents of small children, marking their love in a, quite frankly, bizarre way. Personally, I think it’s a bunch of teenagers thinking ‘let’s mess with the oldies’! It started somewhere small and then spread through Snapchat, or some other social network I’ve yet to get my head around, so that all over the world, there are people scratching their heads, and writing blog posts about shoes in trees. Wasting hours of their precious time trying to figure out what’s going on. Little bastards!! No shoe trees in sleepy Suffolk – only trainers on telephone cables across roads – supposedly marking out gang territories!